For guests over 6 feet, you’ll want to opt for a twin XL size folding bed so they can fit comfortably. When guests stop by for an overnight visit, you always want a comfortable spot for them to sleep. If you don't have a dedicated guest room, though, you probably don't have space for a permanent bed. That's where a folding bed can come in so handy - you can take it out when friends or family are staying over and put it away in a closet when you don't need it. But for your guests to be comfortable, you must choose the right bed. 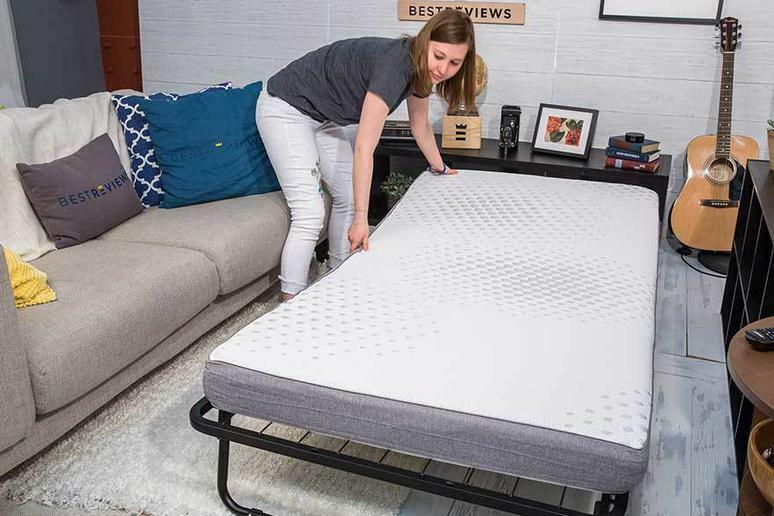 You need to figure out the best size, frame and mattress type, weight, and other features that make a folding bed both comfortable and easy to use. With our convenient shopping guide, you'll have all the facts you need to find the best folding bed for your home. Still feeling confused? Check out our specific product recommendations to make shopping a breeze. Folding beds are usually on the smaller side, so they're easier to store. Most models are twin sized, measuring approximately 38 inches by 75 inches. Some may be slightly shorter, though, so you should check the dimensions to make sure that the bed you choose can fit adults of all heights. It's possible to find queen sized folding beds, but there aren't as many options and you may have more trouble finding a place to store it. The majority of folding beds feature metal frames that provide a durable construction but are still lightweight enough that they're easy to set and fold up. Some folding beds have a slatted base for the mattress to rest, while others offer a trampoline-style base with a piece of nylon mesh stretched over springs. A trampoline-style frame is usually more durable and offers greater support. Folding beds usually have foam mattresses because foam is easy to fold up when it's time to store the bed. But there is some variation in the quality of the foam that's used. Budget-friendly options tend to use high-density foam, which isn't usually the most durable or supportive option. Higher end folding beds often feature memory foam for greater comfort and support. Mid-range options can feature a combination of high-density and memory foam. When you're shopping, take note of the thickness of the mattress too. Thicker mattresses are usually more comfortable and provide more support. For a folding bed to be as easy to set up and put away as possible, you'll want to pay attention to the weight. You may need to lift or carry the bed, so it shouldn't be too heavy for you to handle. Folding beds usually range from about 25 to 68 pounds, so choose accordingly. You'll have a much easier time moving a folding bed in and out of storage if the frame has wheels. Opt for a bed with locking wheels, though, so you don't have to worry about the bed shifting or moving when your guests are asleep. The key benefit of a folding bed is how easy it is to store when you're not entertaining guests. Some models are so compact when they're folded than they can fit beneath a bed, while others may require a closet for storage. Keep in mind that a bed that folds down to a particularly compact size usually means a thinner mattress so you may need to compromise on comfort. Folding beds range in price from about $50 to $300 or more. Smaller beds with thin foam mattress are usually the most affordable, ranging from $50 to $100. Beds with a combination of standard foam and memory foam typically cost between $100 and $200, while folding bed with memory foam mattress usually run from $200 to $300. If you want a queen-size bed, you'll likely pay more than $300. Q. How much weight can a folding bed support? A. It depends on the model that you choose. Most folding beds can accommodate between 250 and 300 pounds, though. Check the product specifications before you buy any bed to verify that it can hold the weight that you need it to. Q. What type of folding bed is best for guests with back pain? A. You want a folding bed that provides plenty of support if you have friends or family members with back issues. A memory foam mattress with a trampoline-style frame is usually the best combination for guests who struggle with back pain. Our take: A durable, stable, easy to store folding bed that can last for years. Its firm mattress may not be for everyone but this is one of the best options on the market. What we like: Boasts a reinforced steel frame and lattice-wired base for an extremely comfortable folding bed. Easy to assemble too. What we dislike: Mattress is extremely firm and is 4" rather than the 5" it's advertised as. Our take: A folding bed that offers comfortable, compact construction at a budget-friendly price point. What we like: No assembly is required. Offers a comfortable design with foam cushion and spring supports. Can be stored beneath a bed, in a closet, or other space spaces. What we dislike: Some owners report issues with the locking mechanism. Must be careful when folding the bed to avoid pinching. Our take: An easy to assemble, compact folding bed that fits into small spaces for storage. The wheel holes may require enlarging, though. What we like: Boasts a comfortable memory foam mattress with helically-suspended poly deck for support. Features a powder-coated frame and locking wheels for stability. What we dislike: Some users find the mattress to be too thin and not as large as a twin bed.